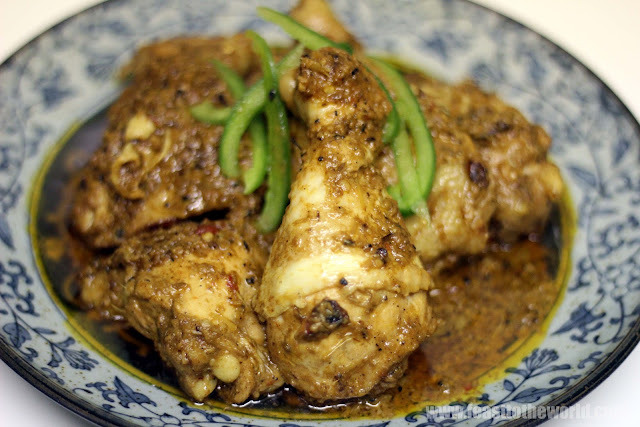 Ayam Percik is one of my absolute favourite dish. 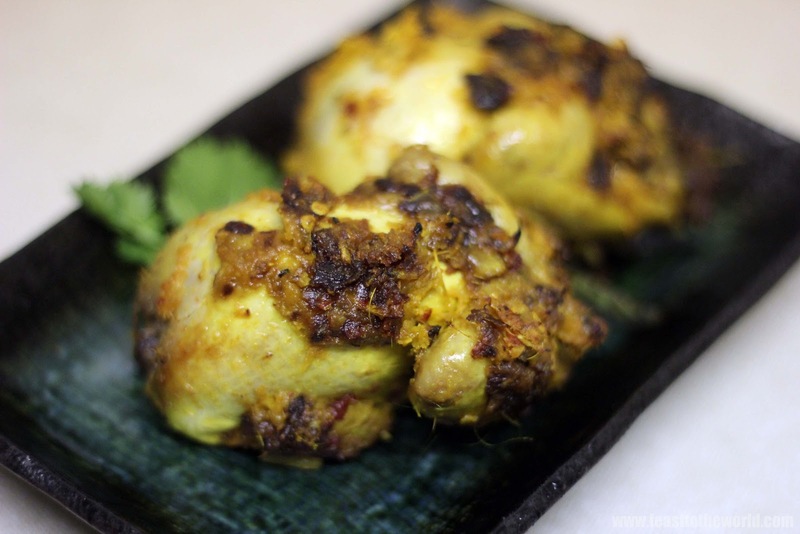 Traditionally, it is made with chicken rubbed and marinated in the flavoursome spice paste and then grilled over hot burning coals to a beautiful charred perfection. As a child, these was a real treat for me and my cousins. 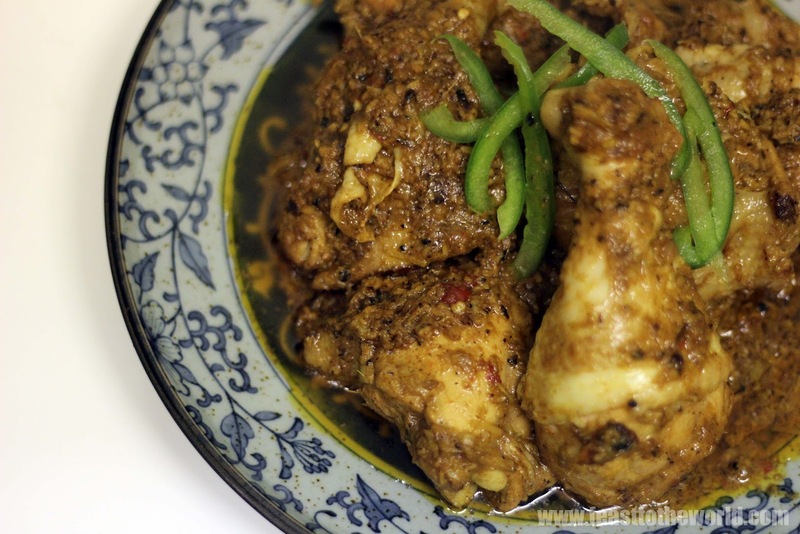 We adored it and whenever this yummy bird dish presented itself onto our dining table, it was always greeted with excitable gasps and lot and lots of tiny greedy hands rapidly reaching for a piece of the chicken. Although admittedly, most of those tiny hands were actually mine keep coming back for more. 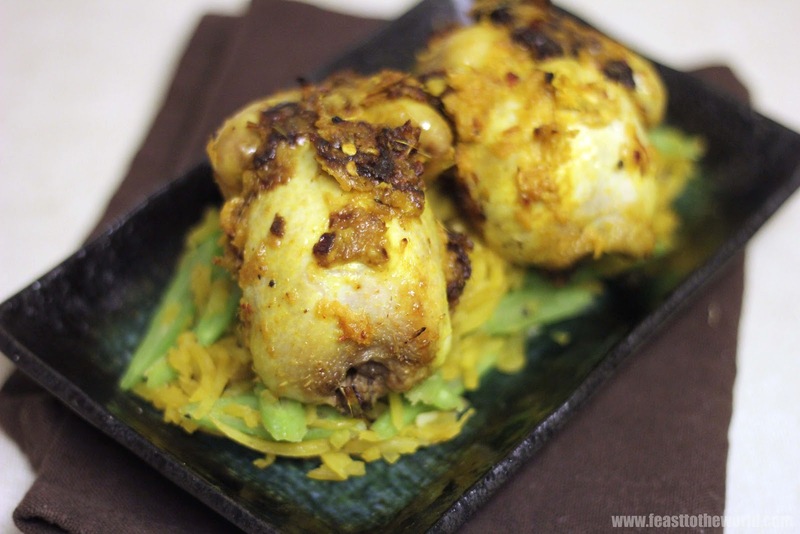 For a modern twist on this classic dish, I have used the adorable quails and subjected them to the Peranakan treatment. Somehow, I think game and Nyonya spices makes for a particular wonderful pairing. With their gutsy and strong tasting flesh, game meat stood up well against the similar intense and rich flavours of the Nyonya rempah. While most people are more familiar with their miniature eggs, these tiny birds are actually rather delicious too. As quails are notoriously tiny - they are no bigger than my clenched fist - I had to be generous and serve two birds per person for a more substantial meal, along with some stir-fried pumpkin and runner beans and Nasi Kunyit. If the weather is good, I would cook this in an outdoor barbecue but as the weather has been rather dreadful these days, a good reliable oven grill will do the tricks. Pound all the ingredients for the rempah into a paste using a mortar and pestle or alternatively, blitz in a food processor. Pat the quails dry with kitchen paper. 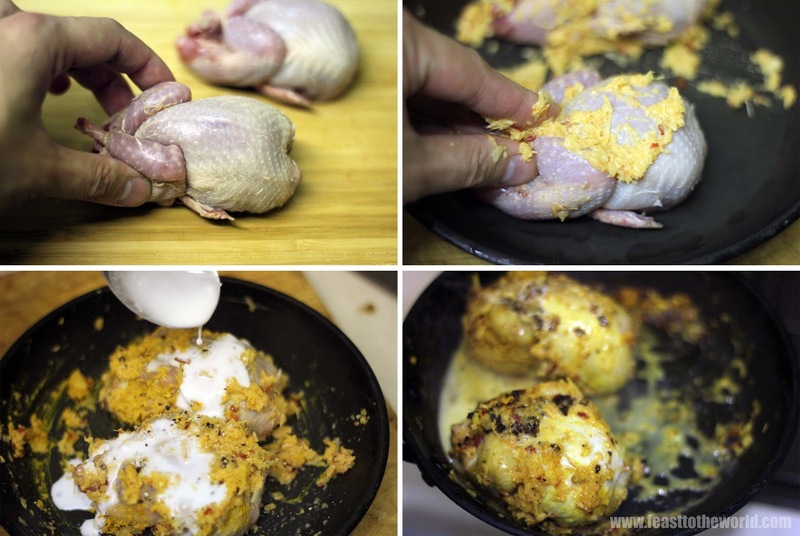 Rub the rempah/ spice paste and oil all over the quail and drizzle over the coconut milk and let it marinate for at least an hour or overnight in the fridge. Pre-heat the grill. Season the quail with salt and pepper and grill them for 5-6 minutes on each side. Remove and set aside to rest for 10 minutes. 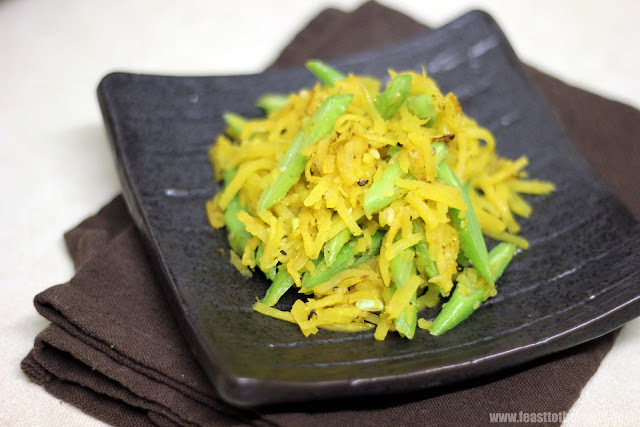 Serve with stir-fried pumpkin and runner beans and some nasi kunyit (yellow coconut rice). Strangely enough, most people will only associate pumpkin with Halloween. Every year around this time, there will be a sudden invasion of these giant luminous orange gourd-like creatures - yes, those scary pumpkin faces! But pumpkin is so much more than just a seasonal decoration to celebrate the witching hour. Hidden underneath the thick orange shell lies some sweet, delicate flesh that is excellent when roasted as it concentrated the sugar content within and caramelised. It is also rather delicious, as I've discovered, when simply stir-fried. 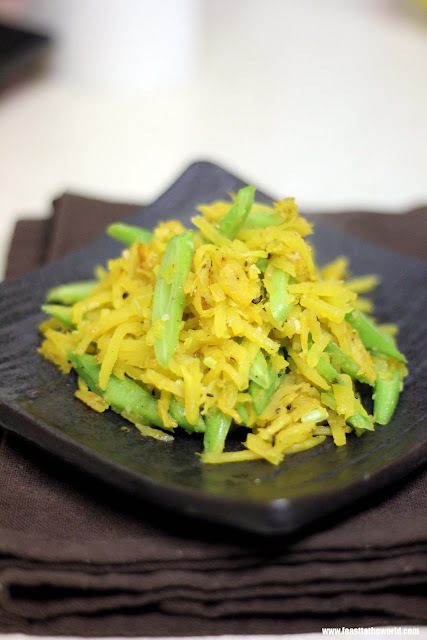 Along with the golden yellow strands of pumpkin, I have used some seasonal runner beans which not only added a crunchy element to the texture, but also a beautiful contrasting colours to the finished dish. So if you are thinking of carving yourself a scary pumpkin face this Halloween, make sure you keep the flesh for this. Heat the oil in a wok over medium heat. Add the garlic and stir fry for 30 seconds, until fragrant. Add the beans and stir-fry for 2 minutes before adding the pumpkins and stir-fry for another 2 minutes. Add the spring onions, fish sauce and sugar and toss well to heat through. Season to taste, add more fish sauce if necessary. Transfer to a serving dish and serves immediately. It's no secret that I'm not an Italian...as far as I know (mum?). But a while back, I decided to make pizza from scratch. Being the same ambitious self or as my friend Goz will say, obsessive, I've made not one but three different toppings. Well, there weren't that hard really, as once the pizza dough and the tomato sauce were made, the rest were all just simply assembling job. For one of the pizza, I've made a spicy topping using the jar of Mexican Chipotles en Adobo which I've made months ago and some spicy sausages. The homemade tomato sauce went into the more conventional salami and asparagus version and then there was the pièce de résistance - Spam (Gasp!) and Pineapple pizza. Yes, you've read that right, SPAM. After my last post proclaiming my love of spam, it is no surprise that I would include this wonderful ingredient and what a wonderful treat it was! 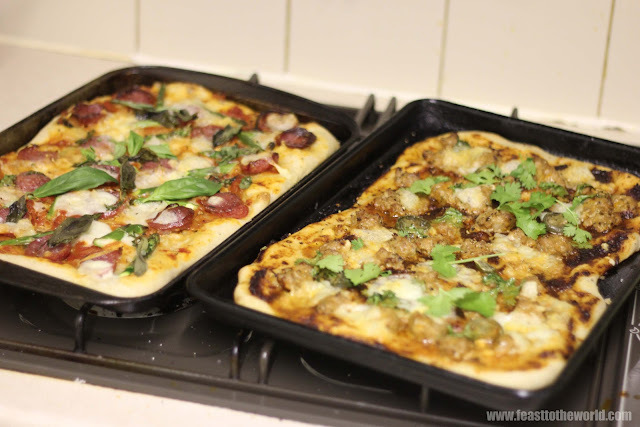 I did received a few objections when the photos of this were shared on the social media site but hey-ho, I have never said that I was making was authentic or traditional pizza. They are just some of my favourite flavours being captured on this brilliant invention of the sunny Italy. And spam was definitely one of them. God Save The Spam! In a large bowl, add the flour, yeast and salt along with the water and olive oil and mix to bring everything together to form a soft dough. Lightly oil the work surface and knead the dough for 10-15 minutes until it is soft and pliable. Cover the bowl with a clingfilm and place in a warm place, such as the airing cupboard and leave to prove for 1-2 hours, until double in size. Knock the air back out of the dough and divide the dough into 3 equal pieces. Leave to rest for 15 minutes before flattening and stretching each piece into a thin round disc, or rectangular for a not-so-conventional pizza. You can either do it with the dexterity of a professional pizza chef or like me, just flatten and stretch them with the ball of you palm and push from the middle and outwards. 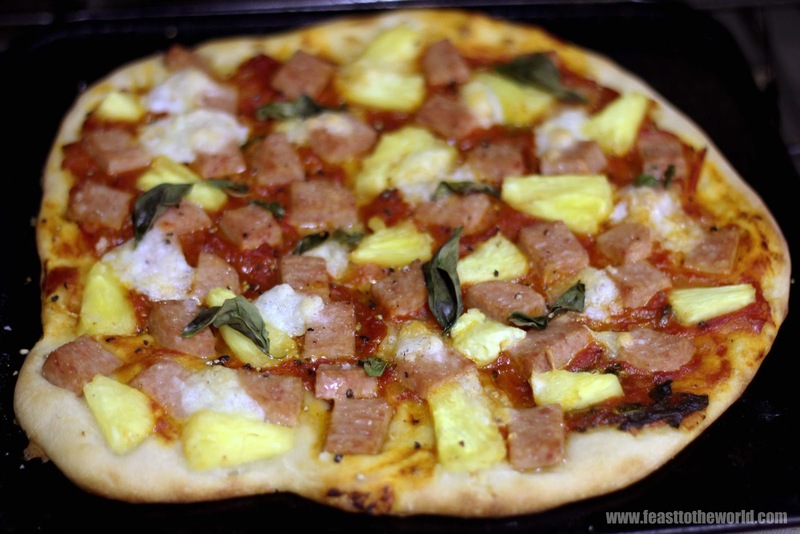 Heat the oven to 240ºC and top the pizza base with the topping of your choice (See below for topping ideas). 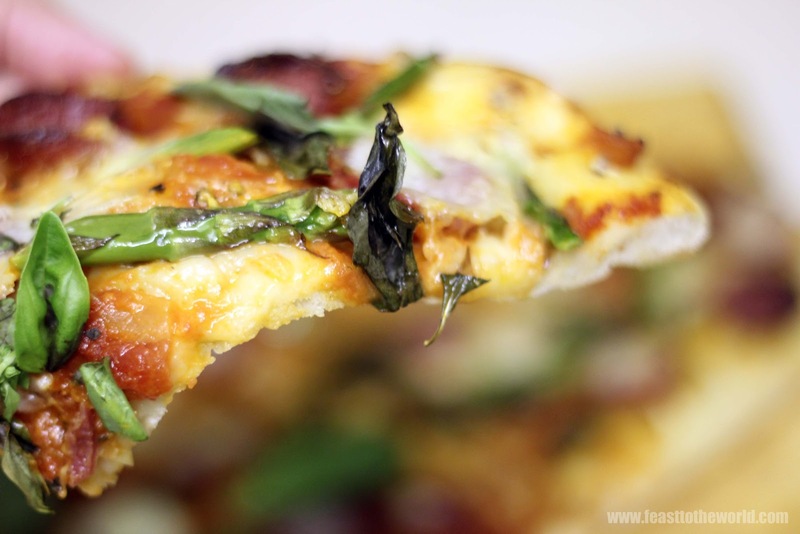 Place the pizza onto a lightly floured baking tray and bake for 10-12 minutes until the crust turn crispy and golden. Heat the olive oil in a pan over medium heat, add the garlic and onion and sauté for 5 minutes, until softened. Add the tomatoes and basil and cook slowly for 25 minutes, until reduced and thickened. Season to taste. Remove and allow to cool. Spread the tomato sauce sparingly over the pizza base. 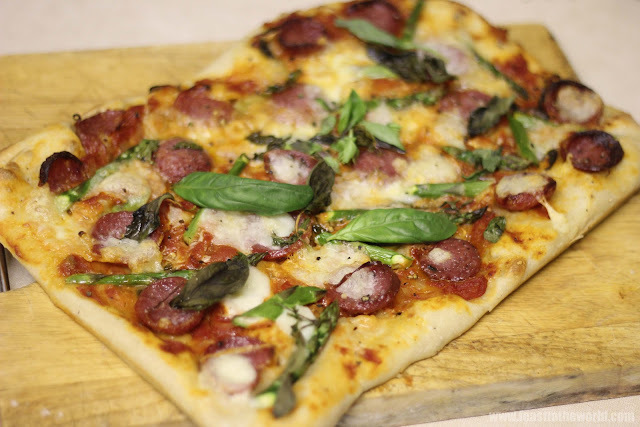 Scatter with the salami and asparagus evenly. Tear the mozzarella into bite-size pieces and dot around the pizza. Season with salt and pepper. Drizzle with olive oil and bake in the oven and serve garnish with fresh basil. 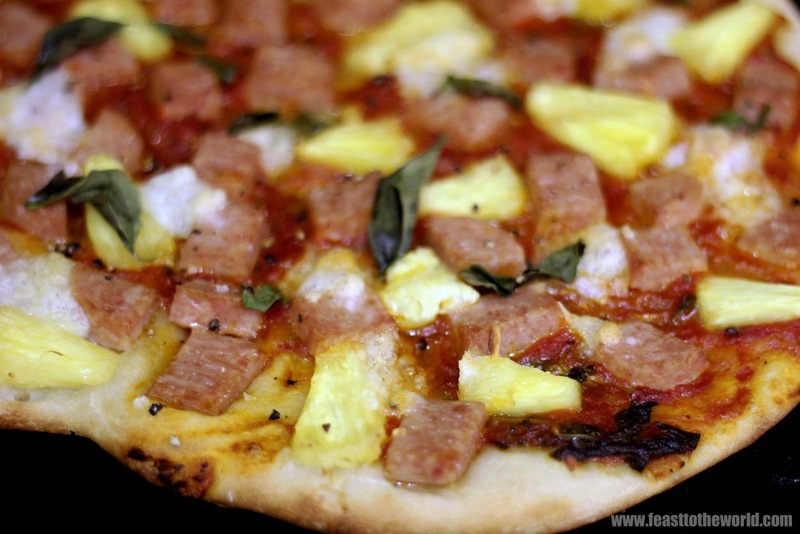 Spread the Chipotles en Adobo evenly over the pizza base. Scatter with the spicy sausagemeat, jalepeño and coriander. Tear the mozzarella into bite-size pieces and dot around the pizza. Season with salt and pepper. Drizzle with olive oil and bake in the oven until crisp and golden. Serve hot. Spread the tomato sauce sparingly over the pizza base. Scatter with the Spam and pineapple evenly. Tear the mozzarella into bite-size pieces and dot around the pizza. Season with salt and pepper. Drizzle with olive oil and top with fresh basil. Bake in the oven until crispy and golden. Serves immediately. 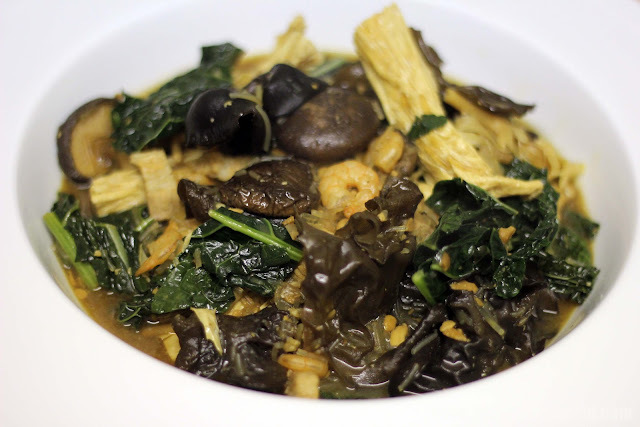 For this Chap Chye, I am using Cavolo Nero, also known as black cabbage or Tuscan cabbage, which is perhaps not the most traditional cabbage to use for this dish. However, I do love the dark green colour which add to a visually even more appealing dish as well as the strong flavour that it contribute to the finished stew - a delectable match made in heaven. If you can't get hold of this, you can certainly use any seasonal cabbage at hand. Ideally, this should be cooked at least a day in advance. Like many wholesome Nyonya dishes such as Ayam Rendang, Beef Rendang and Babi Pongteh etc, the flavours develop overnight to yield a far richer stew. If you are making this in advance, leave out the cabbage and add only when you are reheating it the following day to retain the bright greenness of the leaves. Place the pork belly a pan, pour over enough water to cover and bring to the boil. In the meantime, heat up 1 tablespoon oil in a frying pan until smoking. Stir-fry the prawn shells until turn bright orange and fragrant. Add to the boiling stock and simmer for 30 minutes. Discard the prawn shells and slice the pork belly thinly. Strain and reserved the stock. 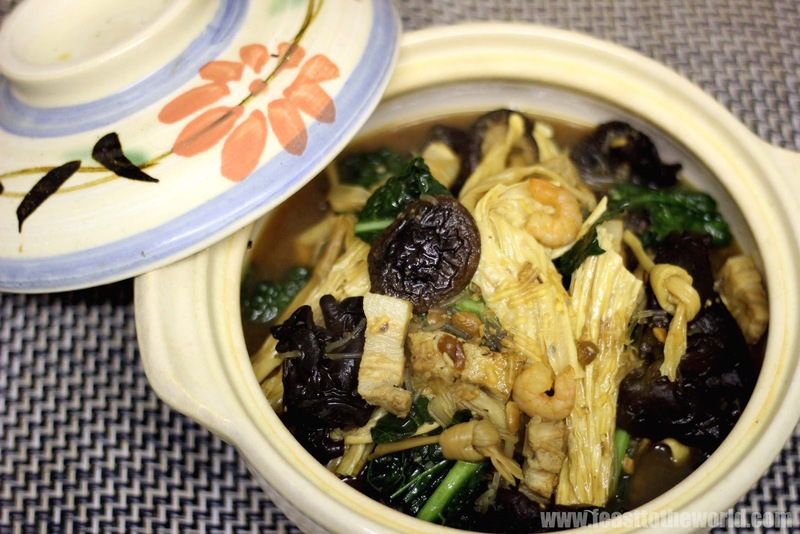 In a bowl, soak the shiitake mushrooms in warm water for at least an hour. Once soften, snip of the tough stalk, strain the soaking liquid and add to the reserved stock. 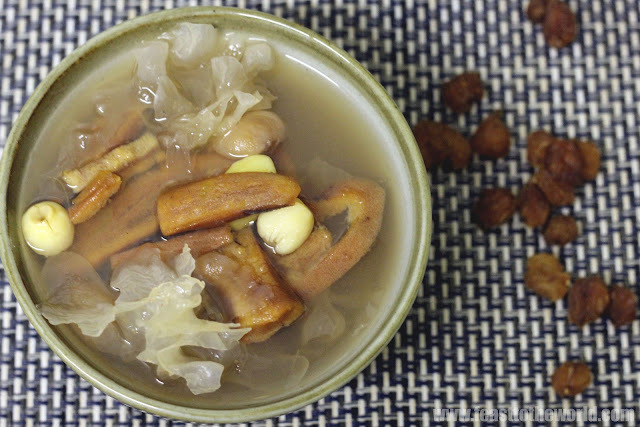 In a separate large bowl, soak the glass noodles, cloud ear mushrooms, tiger lily buds, beancurd sticks in warm water for an hour. Drain. Heat up some oil in a pan over medium heat and deep fry the sweet beancurd sheets for 1-2 minutes, until crispy and lightly golden n colour. Drain on some kitchen paper and set aside. Heat up 2 tablespoon oil in a wok over medium heat. Stir-fry the garlic for 30seconds, until fragrant. Add the sliced pork belly and prawns, soy bean paste, sweet and dark soy sauce, chillies and sugar along with some of the reserved stock, roughly 300ml ( Note: you can add more at a later stage if necessary) and turn up the heat to bring to the boil. When the broth is boiling, add all the soaked ingredients and fried sweet beancurd sheets. Add more stock if necessary until all the ingredients are covered and cook for 10 minutes before adding the cabbage and glass noodles and cook for another 5 minutes, until the cabbage is tender. Do not overcook or you will risk breaking up the contents of the stew. 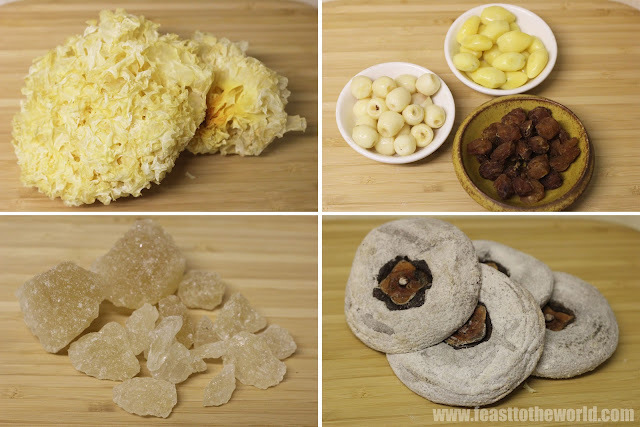 Season with salt to taste and serve hot. This is an incredibly satisfying pudding for me but it does provoke one of those Marmite moments - You either love it (good on you for having great taste in food) or loathe it (what's the matter with you?) For me, this induced fond memories of yesteryear, just like the Ondeh Ondeh, this is something my nan will frequently prepared and being a firm favourite amongst us kids, it's almost a fail safe foolproof pudding as my cousins and I would lap it up without any persuasion, sometimes going in for seconds or even thirds! The glutinous property of the sago pudding is one main reason why many people also detest it. But to be fair, that only happens when it is badly done, i.e. 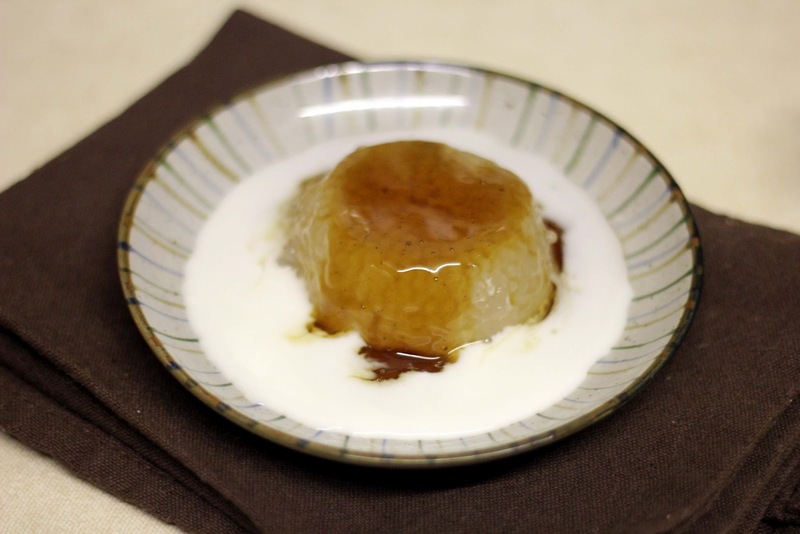 overcooked which rendered it to the unpleasing gloopy, mushy gelatinous texture which will put any baby food to shame. To prevent this, it first need to be rinse to get rid of any excess starch and then soaked in lots of water to swell up each individual pearl before simmering them to the point of just slightly undercooked. It will then continue to cook from the residing heat to the perfect, bouncy texture that I remember so fondly of. 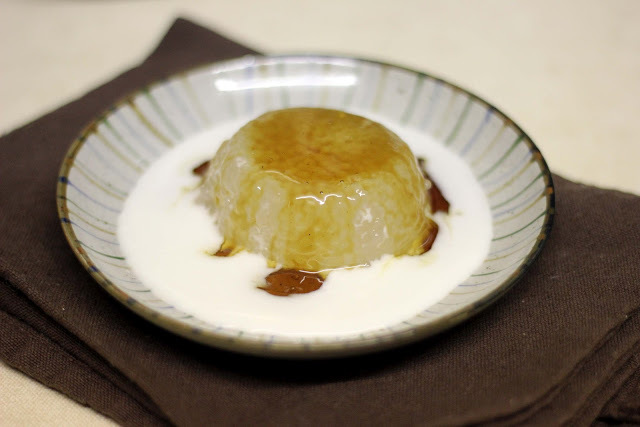 The pièce de résistance is then the crowning glory of the creamy fragrant coconut sauce and the sweet gula melaka syrup which just made the whole pudding all the more moreish. Mmm....I can just have a big bowl of this and in fact, I did! Wash and rinse the sago, then soak in plenty of cold water for 20 minutes. Bring a large pan of water to the boil. Drain the sago before adding to the pan and simmer for 8 minutes, or until they just starting to turn translucent. Drain in a fine sieve and shake to get rid of any excess water. Spoon the sago into 4 ramekin and press lightly to pack firmly. Leave to cool before chilling in the fridge for an hour to set. In the meantime, prepare the sauces. Combine the chopped gula melaka with the water in a small pan and cook over medium heat until fully dissolved and you have a smooth syrup. Set aside to cool. 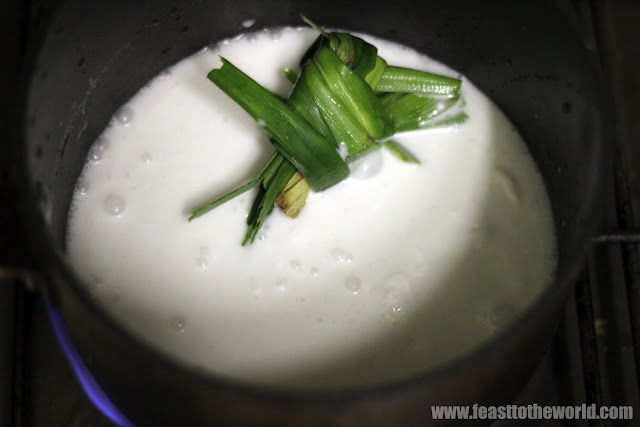 For the coconut sauce, heat up the coconut milk in a small pan, add the salt and pandan leaves and simmer for 2 minutes. Remove from heat and set aside to cool. 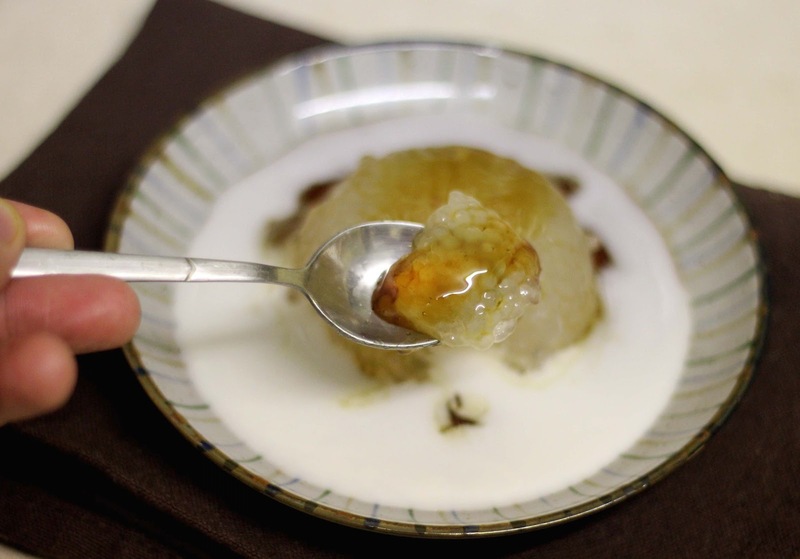 To serve, loosen the sago from the mould and tip onto individual serving dish. Spoon over the coconut sauce and then the gula melaka sauce. Sunday is usually a day for a traditional Sunday roast with all the delicious trimmings but the truth is, after feeling a bit rough round the edges the day before (see my previous post), I have succumbed to the temptation of first making a full English and then later on, decided that I really ought to treat myself to a roast dinner , a simple roast chicken. It was delicious and very enjoyable thank you very much. Now this presented a problem for me, do I have another roast dinner, which will make it two days in a roll ( I was very nearly tempted to) or do I cook something else, something just as comforting and hearty enough for a lazy Sunday lunch? So eventually, I settled for a pasta dish. 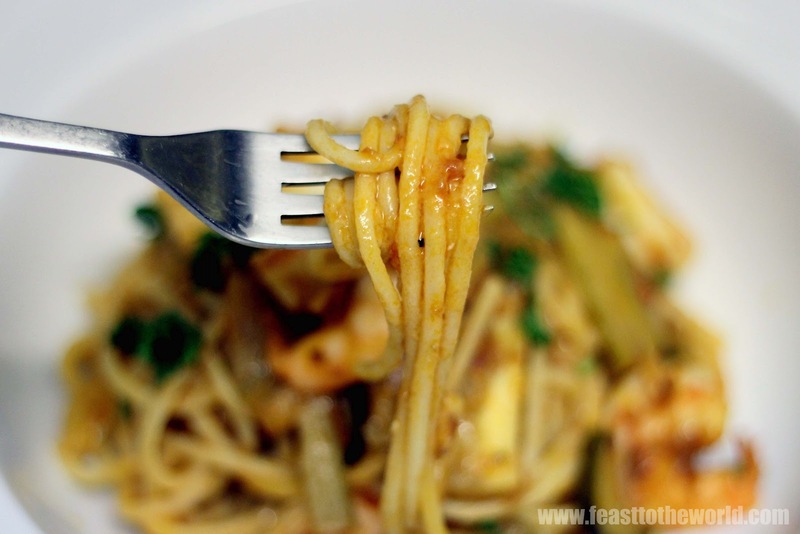 There's always something quite magical about swirling long strands of al dente pasta, coating it with rich tomato sauce. It brings a great sense of comfort and that was exactly what I needed on a Sunday afternoon. 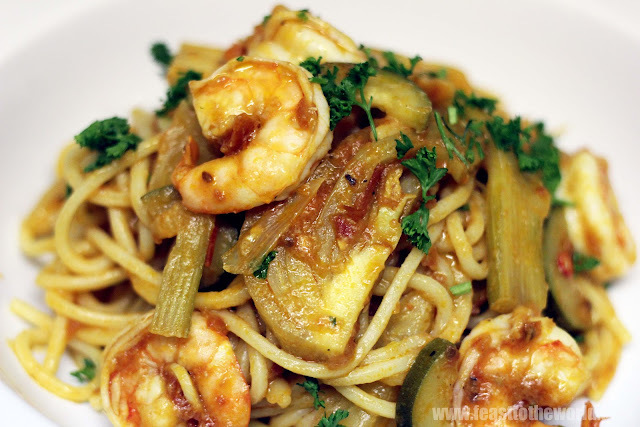 With the lonely fennel bulb that's been sitting quietly at the bottom of my fridge and a courgette (or zucchini), along with some sweet juicy prawns, the humble tomato sauce is immediately transformed into something much more substantial and luxurious. Heat the olive oil in a large saucepan, add the garlic and cook for 1 minute over medium heat, taking care not to burn it. 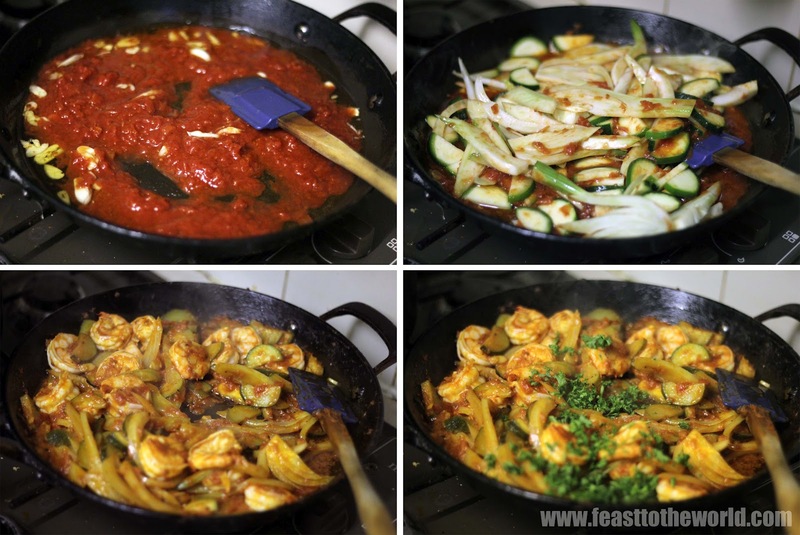 Add the tomatoes and cook for 2 minutes before adding the courgette and fennel. Cook slowly for 12-14 minutes, until the vegetables are soften. Add the prawns and cook for another 2-3 minutes until cook through. Season with salt and pepper to taste. Bring a large pan of salted water to the boil. 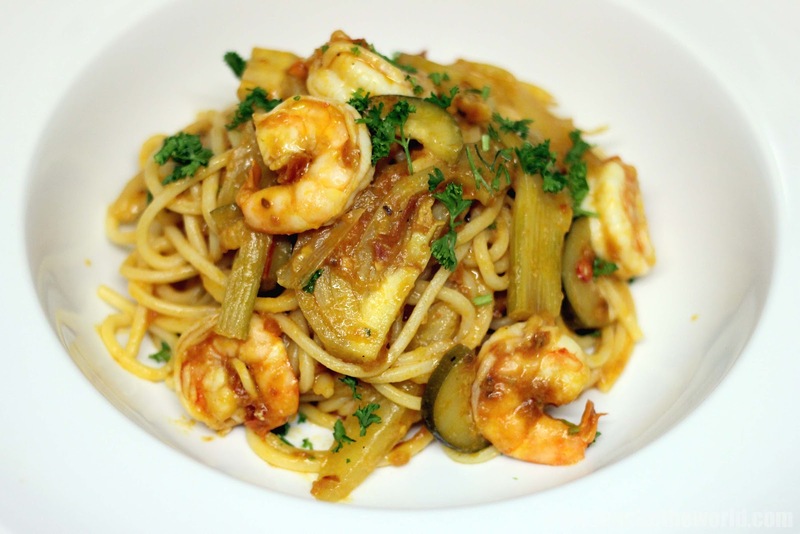 Cook the linguine according to the instructions on the packet, until al dente. Drain and add to the sauce, along with the chopped parsley and toss to mix thoroughly. You know when you are suffering from a hangover, when everything just feels like a chore, even the simple task of getting up felt ten folds harder. You deployed all the energy within you to slide yourself across the bed only to stumble onto the bedroom floor feeling as helpless as a fish out of water. Yes, should have drunk gallons of water the night before but who on earth is that sensible when intoxicated with a lethal mixture of champagne, red and white wine, jägerbomb and a few pints thrown in - an end result of attending a Creative display industry's award. So after a clearly well deserved full English fried up for brunch, I felt the need to cook myself something that is both healthy and effortless. If you come here thinking that you are getting a typical soup for starter then I'm afraid you have come to the wrong place. This delicious soup in question is not what you would typically have as a first course but more as a pudding. 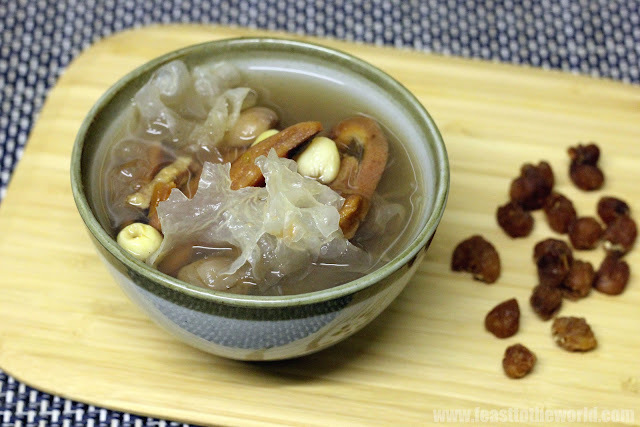 This is a Chinese Cheng Tng (literally translates as clear soup). It is sweet and nutritious and is believe to have a great medicinal purposes so more of a a healthy pudding if you like. 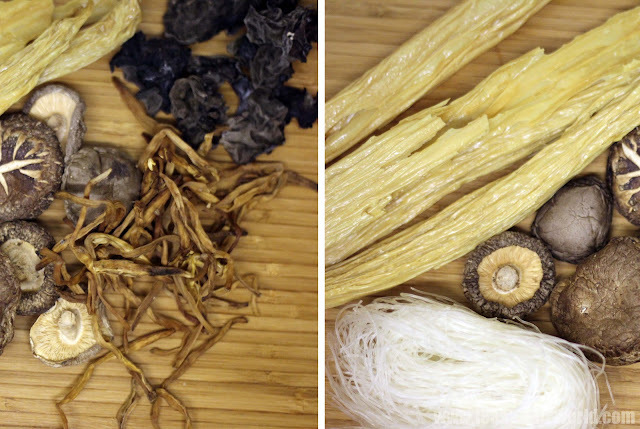 All the goodness comes from the herbal ingredients such as the snow fungus, which provides the soup with a contrasting crunch and the ginkgo nuts, lotus seed and longans etc. On a cold autumnal day, this was perfect as a warming soup but it is equally good when served over some crushed ice, which is what we normally do in Singapore where it is constantly hot and humid. A very refreshing bowl of yumminess and as I discovered, a fantastic hangover cure! Rinse the gingko nuts and lotus seed with cold water and drain. 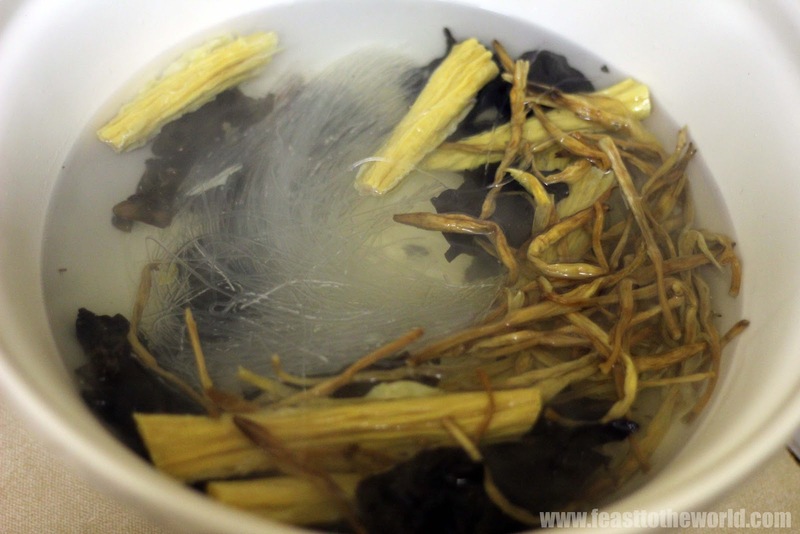 Soak the snow fungus in cold water for 20 minutes, until it swell up. Cut with a pair of kitchen scissors into small pieces. Washed the dried persimmon, wipe dry with some kitchen paper and snip into think sliver with a pair of kitchen scissors. In a large pot, bring the water to the boil and add the knotted pandan leaves, rock sugar, dried persimmon and longans. Simmer gently for 15 minutes. 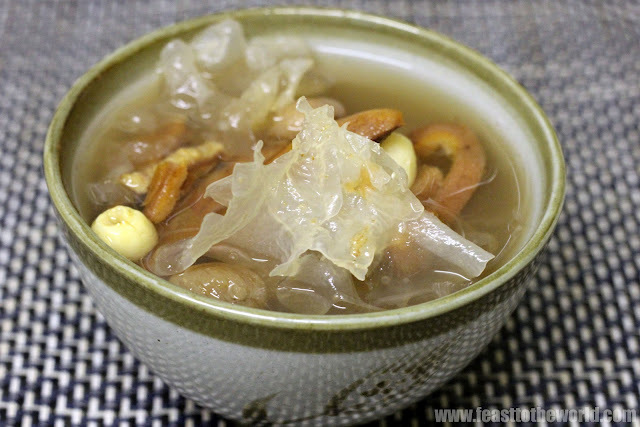 Add the ginkgo nuts, lotus seed and snow fungus and simmer for another 5 minutes. Remove the pandan leaves and discard. Ladle into individual serving bowl and serve warm or alternatively, allow to cool completely and serve over some crushed ice. When you talk about Rendang, almost immediately everyone will mention the famous Beef Rendang (Rendang Daging Lembu in Malay). I love Rendang for it's intensely complex and depth of flavours and it is an incredibly satisfying dish to enjoy while cosying up in the house, underneath the Slangket (oh yes, I have one of those), away from the cold autumnal weather at the moment with a nice bowl of steamed rice. The cooking of Rendang is notorious for being painstakingly laborious. The almost-dry consistency is achieved by slow simmering of the coconut milk in a low heat for hours and hours until most of the liquid evaporates and the reddish oil oozes out. 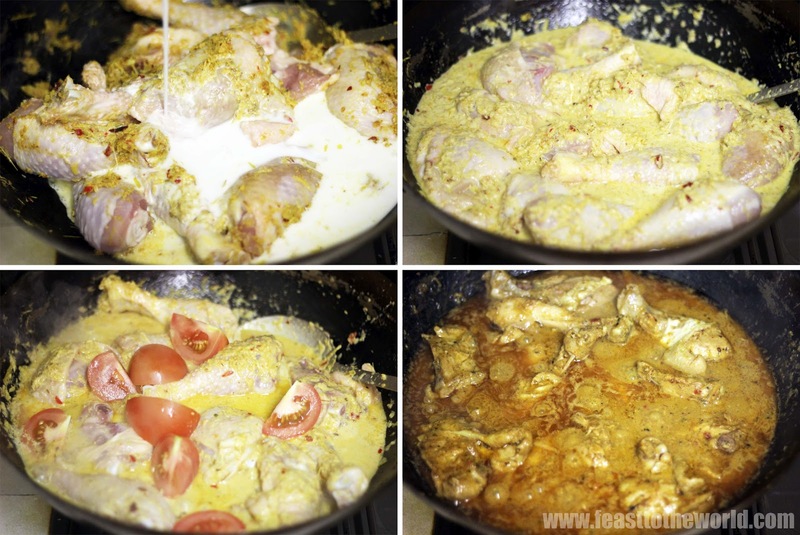 At this point, the braising process turns into frying, thus slowly developing a dark, rich aromatic paste which coats the beautifully soft tender meat. Fry the coconut in a dry frying pan over medium-low heat for 5-6 minutes, until lightly brown, stirring constantly to prevent burning. Remove and set aside. Put all the rempah/spice paste ingredients in a food processor, together with the toasted coconut and whizz into a smooth paste. Add a little of the oil if necessary to keep the mixture turning. 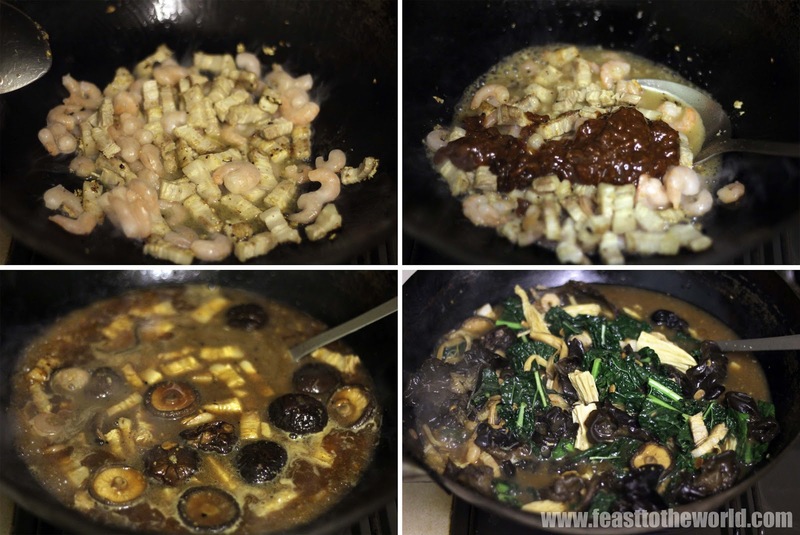 In a large heavy-based pot , heat up 2 tablespoon of the oil and stir-fry the paste over low-moderate heat for about 6-8 minutes, until fragrant and most of the moisture have evaporated. Add the chicken and stir well to coat with the aromatic paste. Add the coconut milk, palm sugar and gently bring to the boil over medium heat. Add the tomatoes and reduce the heat to low, partially cover with a lid and simmer for at least 1- 1 1/2 hours, stirring frequently. Season with salt to taste. 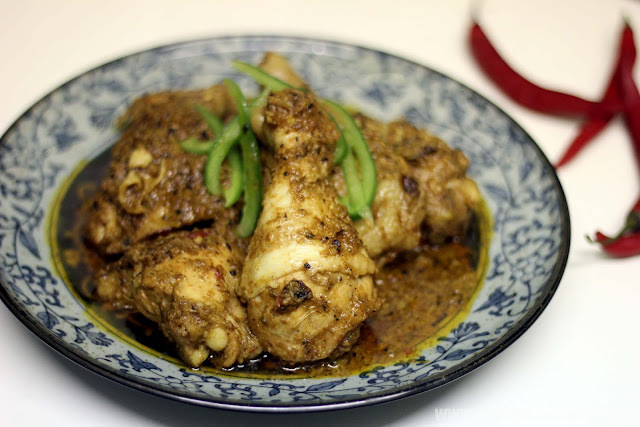 The rendang is ready when the meat is tender and the sauce has almost dried up, leaving a thick consistency and is shiny with a thin layer of oil. Transfer to a serving plate and garnish with the green chilli.